51st State? and/or 52nd, 53rd? "We're at this point of irreconcilable differences," Hare told CBN News. Secessionist talk has filled town hall meetings and the divide discussed is not just ideological. "It's predominately left versus right, but it's urban versus rural because you typically find more typical conservative values in rural America," Hare said. That's the crux of the issue. Rural Americans across many states feel they're not being heard. Their laundry list is long and at the top of that list are stricter gun control laws. According to Weld County, Colo., Sheriff John Cooke, the state legislature is out of control. "They are out of touch with rural Colorado," he said. "There is an attack on rural Colorado and it's not just on gun control laws. It's on several of the other bills that they passed." Government mandates on renewable energy, environmental policies restricting oil and gas drilling, and controversial social issues like gay marriage have also led to this divide and talk of secession. Organizers want to create "North Colorado," an idea that went to voters in 11 counties this past fall. But not everyone in Colorado thinks secession is a great idea. "I don't think that's necessarily the way to make something happen within the area you live," Colorado resident Greg Howe told CBN News. "You're supposed to work within our electoral services." 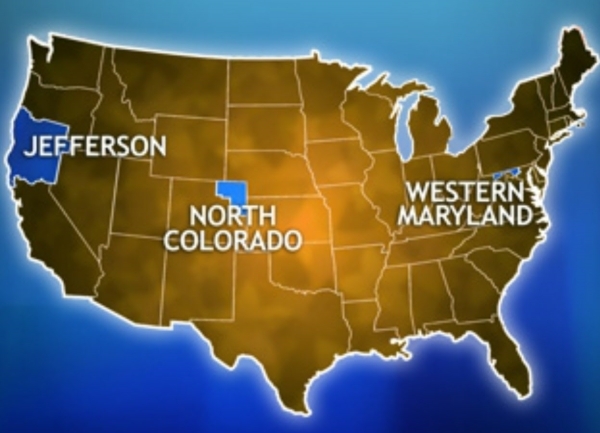 The so-called secession movement in Colorado had mixed results this past November. Some counties approved it. Others didn't. But the organizers of the 51st State Initiative are undaunted, saying this type of movement takes time. "Movements take a while; education takes time," Hare said. "People do have a hard time saying ,'I want to live in a different state,' even though physically they live in the same house." "It's hard for them since their lives have been Coloradoans," he explained. "Their whole lives to say that 'I'm going to be a new Coloradoan' or 'I want to live in the state of liberty' or something different." That desire for something different can also be felt in Arizona, Michigan, and in Western Maryland where thousands have signed secession petitions. One website reads, "We intend to exercise our right of self-determination and self-governance to better secure our rights to life, liberty, and the pursuit of happiness." Scott Strzelczyk, the leader of the Western Maryland movement, is ready to get going. "If they are not going to listen or take our needs into consideration and govern in a way that's more in accordance with the way we want to be governed we are seeking an amicable divorce," he said. Meanwhile, in Northern California and Southern Oregon, activists want to come together in the state of "Jefferson." Their proposed state flag includes two "Xs," representing their feeling of being double-crossed by the state capitals of Sacramento, Calif., and Salem, Ore. Creating a new state isn't easy. The last time a state actually gave up territory was in 1820, when Maine split from Massachusetts. Since then, additional efforts have been unsuccessful. The first step is getting it passed by the state legislature and then the U.S. Congress. "This is a valid constitutional process that our founding fathers specifically wrote into the Constitution," Hare said. "Well, if they didn't write this into the Constitution to be used, then why did they write it in?" But supporters have an uphill battle since the media will not be their friend. "The danger is once the outside media start to grab hold of it, the attention is on the difficulty, the almost impossibility of it happening," professor Derek Everett, with Metropolitan State University in Denver, explained. State secession proponents, like Roni Bell Sylvester of Colorado, say they will keep fighting because the dismissive attitude of state legislative bodies must end. "I find the sort of arrogant, dismissive to be further proof as to just how disconnected the urban is from the rural," Sylvester said. Movements like the one in Colorado and other states could be just the beginning -- at least that's the talk at town hall meetings in places like Colorado and elsewhere. It's called 'voter disconnect" where the people say they've had enough and are crying out for something to be done. "We, at some point, have to figure out a way to get our point across or at least be able to have a dialogue and not be ignored because you haven't seen anything yet over the next 5 to 10 years," one resident warned at a recent town hall meeting in Colorado. As for Hare, he said it boils down to one simple concept. "I think ultimately what people want, whether you look at it from a right or left paradigm, is government to stay out of their business," he said. Note: This information (in the public domain) is provided as neither an endorsement nor a disclaimer of it's content. Also, printing this page purposefully drops the images.